Home » Company News » Do You Need a 24×7 Contact Center Vendor? Do You Need a 24×7 Contact Center Vendor? As consumers, we want every call center that provides us service to operate 24 hours a day, 7 days a week. We want to be able to call and order a “thingamabob” at 1:00 AM, as well as, reach a live person to help when it’s 90 degrees and the air conditioner stops working. As consumers, we LOVE to have the convenience and reliability to pick up the phone and get what we want or need on our time schedule. The reality is, we don’t always get what we want and must compromise and call back during regular business hours and in some instances, it’s perfectly okay – just a little inconvenient. But what about the times when you need immediate customer service? And how does a business determine if offering 24×7 inbound call center services is necessary? 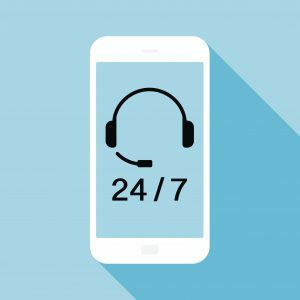 When I step away from being the consumer and look at it from a logical business perspective, there are several factors that companies should consider when determining if a 24×7 Contact Center Vendor is necessary for handling their inbound customer contacts. First, the bad news is that 24×7 staffing at a contact center vendor is more difficult and more expensive than normal business hours staffing. When a contact center vendor provides staffing for 16 hours a day or 24 hours a day, the added isn’t just the additional staffing. The contact center vendor must also ensure that the team is supported by management, quality assurance and technical staff. With a 24×7 operation, your contact center vendor is never closed, so making any sort of adjustments to software or repairs to equipment must be scheduled carefully and effectively to minimize any disruption to the service provided to your customers. With a 24×7 call center operation, you must determine how holidays are handled. Do you customers expect 24x7x365 days a year? If yes, scheduling can become a significant challenge and many state laws require paying employees double time on holidays. Forecasting call volume to staff the nonstandard hours is more delicate. It’s on a smaller scale than standard hours and this means your accuracy could make the difference between being understaffed or overstaffed more easily. Managing a 24×7 call center operation with different call types, including order taking, customer service, billing questions, technical support and other types of calls may mean that you need to cross-train more staff that work the non-peak hours of operation to ensure you have staff to cover all the different skills required for different incoming call queues. Another factor to consider when evaluating if your contact center vendor needs to be 24×7 is the availability of a good quality workforce during the graveyard shift. If your selected contact center vendor can’t recruit good, reliable people for the middle of the night shift, then your program may be better off playing a message letting callers know your hours of operation and asking them to call back – especially if the volume of calls is very low. Operating with less than 24×7 hours of operation may not be an option. Here are some reasons that you may absolutely require a 24×7 contact center vendor. Is the volume substantial enough to cost-effectively staff the contact center vendor operation during all hours of the day, 7 days a week? Do your customers and prospects require 24×7? For healthcare organizations or home service contractors, the answer is more often “Yes”. Life happens at any hour and can require immediate attention, or the outcome could be life altering. Some are professional services such as financial, insurance or lawyers who all are important and valuable services that are impactful on a consumer’s day to day life. And there is the retail industry – so accessibility, convenience and being able to talk to a customer service representative at 1 am about my “thingamabob” that arrived damaged, makes them stand out against the competition. While the decision is not always clear-cut, these are some points to consider when analyzing if your contact center vendor needs to be 24×7. In my opinion, many companies can benefit from providing an open line of communication with a live person at all hours. It promotes confidence, trust and reliability. You just must understand if the cost is worth the benefit. Patricia Qvern is an Operations Manager at Quality Contact Solutions, a leading Outsourced Contact Center Vendor. Patricia ensures her clients get the results they require, using big picture thinking and more than 20 years of experience in the telemarketing and call center industry. As an Operations Manager, she is responsible for managing the day to day relationship with the clients and our front-line contact center teams. This entry was posted in Articles and tagged Inbound Call Center, Inbound Telemarketing Services, Shared and Dedicated Inbound Call Center on March 30, 2018 by .